If you have attended a college or university located outside of Canada or the United States and are planning to enroll in a canadian university or american college, you will have to request from all education institutions that you have attended that they provide you with official academic transcripts. (Academic institutions that you are applying to will often require that transcripts be submitted to them directly from the issuing institutions.) The procedure for issuing academic transcripts varies from one jurisdiction to another. If you are not certain whether or not the school(s) you attended will provide academic transcripts directly, you need to contact each one individually to determine what procedures apply for securing transcripts. The process may be time consuming as delays are not uncommon – you be well advised to begin the request process early on in your application for enrollment. Learning institutions in some countries do not issue academic transcripts to other schools. Instead, they provide the original diploma/certificate and report of grades achieved (i.e. academic transcript) directly to the student. You will have to make a photocopy of these original documents and arrange for the issuing institution(s), namely the school(s) you attended, to certify or attest that the photocopy is a true copy of your original document(s). Canadian and U.S. embassies and consulates may be good fall-back resources for the attestation of educational documents. 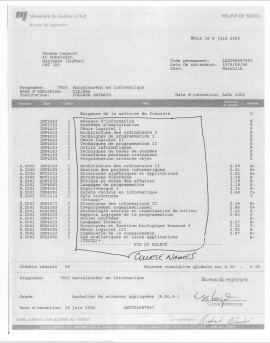 When official academic transcript are in a language other than English (or, in Canada, other than English or French depending on the institution that you are applying to), you will be required to have the documents translated before a determination can be made as to whether or not you meet the admission requirements of the learning institution you are applying to. Both residents of Canada and of the United States may contact the consulate or embassy of the transcripts' issuing country to request a translated version of the documents – invariably, such requests are referred to a certified translation service. In addition to providing academic transcript translation services from any language into the English, French or Spanish languages, we can also assist you with the translation of English language material into the world's most popular languages: English to Chinese; English to Arabic; English to German; English to Japanese; English to Portuguese; English to Russian; English to Korean; English to Italian; English to Hindi; to name but the most popular among the more than 75 languages that we can handle for you.